Remembering footballing legend Sir Bobby Robson, the nation’s newspapers today mark the occasion by reproducing some of their most memorable quotes from his career that they littered with abuse and even accusations of treachery. Pundits were not always so one sided in their treatment of an England manager too much of a gentleman to hit back. Indeed a different approach was taken when England drew with Saudi Arabia. Over time the press came to further modify its approach to an England manager that many consider the most successful ever, taking England to a narrow defeat in a Word Cup semi-final penalty shoot-out. But, even as time passes and the same newspapers that heaped so much abuse in death now lead with lavish tributes to Robson, who sadly lost his fifth battle with cancer at the age of 76 this week, the more senior journalists remember him at the peak of his career. Scores of fans made their own tearful tributes to Sir Bobby at Newcastle United’s St James’s Park stadium, with many fans laying memorial tributes of shirts, flowers and banners. “I were so shocked to hear of Sir Bobby’s passing, like,” said one tearful man dressed as a barcode. “I was having two weeks off work ‘cos some website said I might have Swine Flu and wanted to just lay a momento from the 2003/2004 season when the Toon Army should’ve won the World Cup,” he added laying down a handmade banner reading ‘Sack Robson NOW!’. 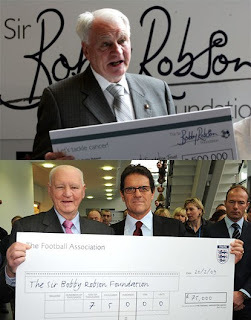 Retro memorabilia of Sir Bobby is something that the newspapers are also considering producing. The Sun newspaper said that the timing of Sir Bobby’s death was perfect for them to hand out more “Sack Robson!” badges from 1984. The acrostic is a nice touch.